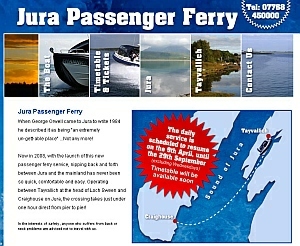 First there were merely plans, then the passenger ferry between Craighouse and Tayvallich started and now there is a website. It seems that the whole operation is well embedded into the island community and people probably no longer accept it when the ferry would stop after the trial period of three years. And who can blame them, the awarded ferry service makes the island accessible for visitors and locals alike. A day trip to Jura from the mainland, or vice versa, is now possible with the new passenger service. In former times one had to travel to Islay first and then take another ferry to Jura. It’s like the new website states: “When George Orwell came to Jura to write 1984 he described it as being “an extremely un-gett-able place” …Not any more!” A ferry service is vital for a small community and makes the island attractive for people to live and work on, thus preventing a community from becoming smaller and smaller making it harder for the people to have a life there. Hi Dave, you are so true. I wonder how they can justify the 17% increase. Compared to last year the fuel prices have gone down considerably. You can’t compare this business with Calmac but they increased fares with 3.8%, which is already quite a lot if you ask me. Mind you, as a foot passenger you pay almost 15 pounds for a return ticket from Kennacraig to Islay and a couple of pounds for the Port Askaig to Feolin ferry. No comparison I know but they have to watch what they are doing!! You obviously have a point about fare increases, but at least they are providing a reliable service. I was stuck on Jura with young family last year when the car ferry broke down. A pleasant day trip turned into a three day nightmare. When I eventually tracked down someone in the A & B council to write to I was given the brush off, with the excuse that this is one of the risks that you run by going to an island. Judging by the track record of the Eilan Dhiura the only reliable part of the service being offered is the regular breakdowns. Because of that and the spineless council we decided not to visit Islay / Jura this year and went elsewhere on holiday. I plan to try out the passenger ferry over the school holidays, and am looking forward to it because I am confident of getting home again!! !